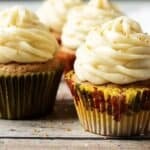 Strawberry Lemonade Cupcakes: We are contributors to Life’s Little Sweets, and this recipe first appeared on there as Strawberry Lemonade Cupcakes. Our strawberry lemonade cupcakes were a Mother’s Day treat and loaded with tons of strawberry and lemon flavors. The perfect Summer treat! This recipe originally appeared on Life’s Little Sweets as a contribution post for Mother’s Day. Seeing as how the cupcakes have the flavors of lemonade and strawberries, we felt it would also make a fantastic Summer post. For this offering, we decided to take it easy and use some packaged ingredients. The lemon cake mix combined with the lemonade mixture packs a tasty punch. Using a cake mix creates soft and fluffy cupcakes. Furthermore, you don’t have worry about them becoming dry or sinking in the center because the cooking chemistry is perfectly balanced. The homemade part of the dessert is the strawberry buttercream frosting. Using only three ingredients, it’s simple to prepare and overloaded with berries. If you have ever made this type of frosting before, then you know how smooth and creamy it is when prepared correctly. All you need are the listed items below and a simple mixer. As you can see from the pictures, decorating these little sweet bites doesn’t take a lot of flash or props. Colorful straws and cute liners are all it takes to make them adorable. Additionally, the strawberries have a soft pink hue, so no food coloring is required to achieve this look. While these cupcakes may have been originally for Mother’s Day, they can be made anytime and for any occasion. Lemon and strawberry are two classic Spring and Summer flavors, so it’s the perfect time of the year for this kind of dessert. It is my hope you give them a try. In closing, I wish everyone a long life, love everlasting, and a full belly! Our strawberry lemonade cupcakes were a Mother's Day treat and loaded with tons of strawberry and lemon flavors. The perfect Summer treat! Start by pre-heating your oven to 350 degrees F. and remove the butter from your fridge to soften. Next, prepare the lemon cake as directed by combining the mix, vegetable oil, eggs, and lemonade powder in a large bowl. Blend the concoction on medium speed until everything is well-combined. Afterward, line your cupcake pan with liners and transfer the cake batter into the pan. Use 1/4 cup of batter for each serving. Then place the pan into the oven and let everything cook for about 12 to 15 minutes or until the cupcakes are done. Use a toothpick to ensure they have baked long enough. Now, set the finished cupcakes onto a cooling rack and get started on the frosting. First, wash the strawberries and remove the stems. Then, place them into a food processor or blender and pulse them until they are liquefied. Next, strain the berry puree to ensure all the seeds have been removed. You should have about four tablespoons of strawberries. After that, combine the strawberries, butter, and sugar in a large mixing bowl using a stand or hand mixing. Blend the ingredients until the frosting is smooth and creamy. Lastly, load the icing into a cupcake decorator or using an icing knife, apply the frosting to each cupcake. Make the cupcakes are cooled off, or the frosting will melt. Once all the cupcakes have been iced, serve and enjoy! The calorie count is an estimation per cupcake. Please allow the cupcakes to completely before applying the frosting. If needed, place the frosting back your fridge for 15 minutes to stiffen before using. Dessert will hold in your fridge in a sealed container for up to two days. Yum, strawberry lemonade does sound good! I’m not a huge cupcake baker, but I don’t mind eating them if someone else has baked. I’ve just been more of a cake person. Sounds like it’ll be worth my while to give it a try, especially since I saw cupcake liners peeking out at me from the back of the cupboard a few days ago. Thank you for commenting, Cheryl! I hope you give them a try and love them 🙂 The recipe uses cake batter so they have the texture and flavor of cake. Hopefully, you enjoy them. Have a great weekend! This combination makes my mouth water! I have to say, these sound so good and it’s like the perfect summer cupcake! I have never had strawberry frosting so I think I will defiantly have to try these out! They just look so darn delicious! I make a Strawberry Lemonade COokies but I have never tried cupcakes. I need to try this. My kids love chocolate but Strawberry and lemon are their favorites! Thanks for the perfect summer cupcake recipe! Strawberry lemonade is one of my favorite flavors. I had pink lemonade tonight for a birthday celebration, but it is not the same as strawberry lemonade! I like the icing the best, but the whole cupcake is mouth watering. What a fun way to make a cake! I would have never thought to mix the lemonade powder into the actual batter…that’s so fun! And the strawberry lemonade combination is always a winner! Sounds delicious. These look so delicious. I will try them out at my kiddos birthday party! I never thought to mix cupcakes with lemonade but love the concept! Wow! This sounds like they’d come out fluffy! I like the idea of strawberry lemonade cupcakes and I do love the color of the icing. I also love that you don’t need food coloring either. Yum! We are having a family get together this coming weekend and I think these are easy and delicious enough to make!